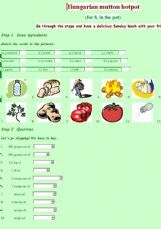 You can find 5 exercises in the topic of food and cooking here: matching exercice with ingredients,a wordsearch, steps of preparing food and a short video for letter-writing with Mr. Bean. 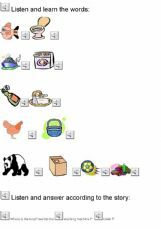 A simple exercise based on Where is Maisy�s Panda by Lucy Cousins chidlren�s story. We read the story in class, learned the vocabulary and practice asking the question: where is.... 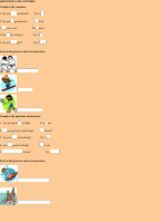 This exercise helps the children practice the structure and vocabulary at home. 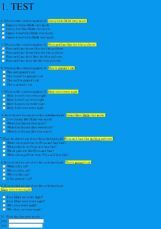 Ls will have fun deciding which sentence is affirmative, which is negative and which is interrogative! Students will practice interrogative and short answer structures using watersports vocabulary. 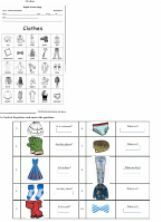 practice vocabulary and answer question about clothes.